The draft sounds the right notes, but in many respects it's more tentative than what Vision Zero calls for. Last week, the Hancock administration released its draft Vision Zero plan, laying out a rough strategy to eliminate traffic deaths and serious injuries by 2030. 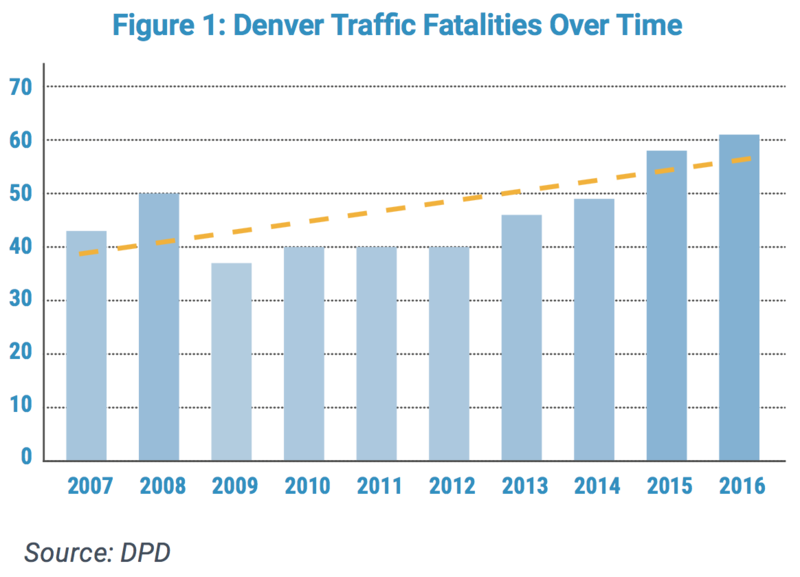 Between 2005 and 2016, 582 people lost their lives in traffic crashes on Denver streets, and the trend is heading in the wrong direction. The draft action plan is our first glimpse at how Mayor Hancock plans to bring that number down to zero, a goal he first committed to nearly a year and a half ago. The plan sounds the right notes about the moral imperative of preventing traffic deaths. It includes plenty of good ideas that will save lives if implemented, and it sets up mechanisms to track progress and hold policy makers accountable. Many of its targets are too vague or tentative, however, to get the city on track to eliminate traffic deaths in a little more than 12 years. If you want Denver to aim higher with its street safety blueprint, head to the city’s website to weigh in on what you’d like to see in the final draft, due out in September. Vision Zero programs tend to be successful when they clearly define goals and strategies for public officials to implement. To that end the action plan identifies five broad objectives: institutionalizing street safety in the day-to-day business of city agencies, engineering safe streets for everyone, reducing speeding, promoting “a culture of safety,” and improving data and transparency. Within that framework, one of the most concrete targets is to build or upgrade 88 miles of bike lanes and 88 miles of sidewalks over the next five years. This would be a significant acceleration. The city averaged about nine miles of bike lane installation annually between 2011 and 2015, and doesn’t fund sidewalks to any significant extent. In the first five years, the city also aims to redesign parts of eight streets in the city’s “high-injury network” — 27 streets that account for 95 percent of traffic deaths — though it’s not clear how many miles these redesigned segments will cover. For other objectives, the city seems to be setting a low bar. A pledge to install or upgrade street crossings that align with the city’s forthcoming pedestrian plan, for instance, will only improve about four crossings per year in the first five years. Thirteen intersections will be redesigned in the first five years. Some changes could yield profound benefits by embedding safety as a core value in city policy. Street projects will be routinely evaluated based on metrics like crash rates and the prevalence of speeding. The city will document progress on Vision Zero via semi-annual reports, and “establish an official crash data source” so the public can assess where interventions are needed and whether policies are working. Crucially, the action plan calls for a change to street design standards. 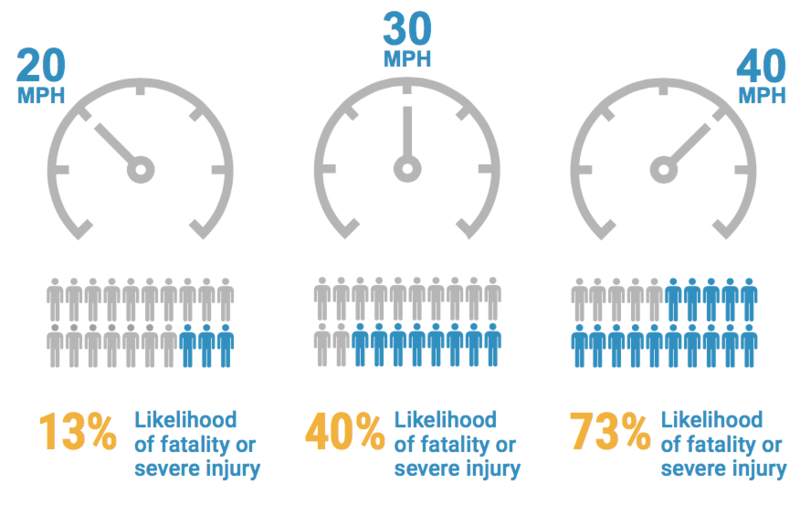 Noting that speeding factored into to 53 percent of traffic deaths in 2015, the city will create a “speed management program” that “develop[s] methodology for speed data collection, street design changes, automated enforcement, and manual enforcement” in the next two years. The plan commits to lowering speed limits on newly redesigned streets, and says staffers will “explore ways to make changes” to speed limits after a citywide evaluation. Some additional automated speed enforcement vans will be deployed each year. The city will lobby the Colorado General Assembly to ease up restrictions on automated speed enforcement as well, though not until three years from now. Given that Denver’s most dangerous streets tend to be state roads under CDOT’s jurisdiction, the city needs cooperation from the state in order to succeed. CDOT helped form the plan and will be responsive to the city, said Director of Transportation and Mobility Crissy Fanganello. Within the next two years, DPW and CDOT will take one state highway (probably a southern portion of Federal Boulevard) and pilot a package of street safety fixes that could be replicated on other deadly sate highways that double as neighborhood streets.